President Muhammad Buhari, according to the Guardian News, has urged labor unions in the country to allow his administration concentrate on fixing infrastructure, rather than distracting it. 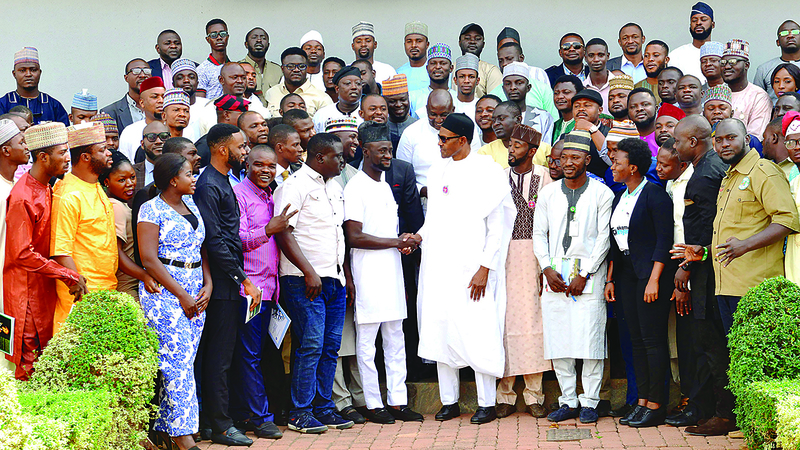 The President made the appeal yesterday while playing host to the Executive Committee of the National Association of Nigerian Students (NANS) in the State House, Abuja. “In three and a half years, we have improved tremendously on what we met. We are trying to do infrastructure. No matter which part of the country you come from, you will see efforts we are making in terms of roads; we are fixing rails, we are trying to do power, through the use of gas and solar. If you note what we have done in these three and a half years, you will not regret voting this administration into power,” PMB said. The Guardian News reports that Buhari said he had explained in details while presenting the 2019 budget estimates, the earnings and expenditure and , therefore, expected the elite to understand the position of the government on certain issues. He advised the youths to prepare themselves for leadership positions in the country. Earlier, the students’ body, led by its National President, Comrade Danielson Bamidele Akpan had sought FG’s intervention to end the incessant strike action in the education sector and also to look into the plight of students in different institutions who have been expelled for political reasons.